We’ve made this delicious dip twice now, once for our family to enjoy and once for a friend’s party. Both times it was awesome and eaten very quickly! 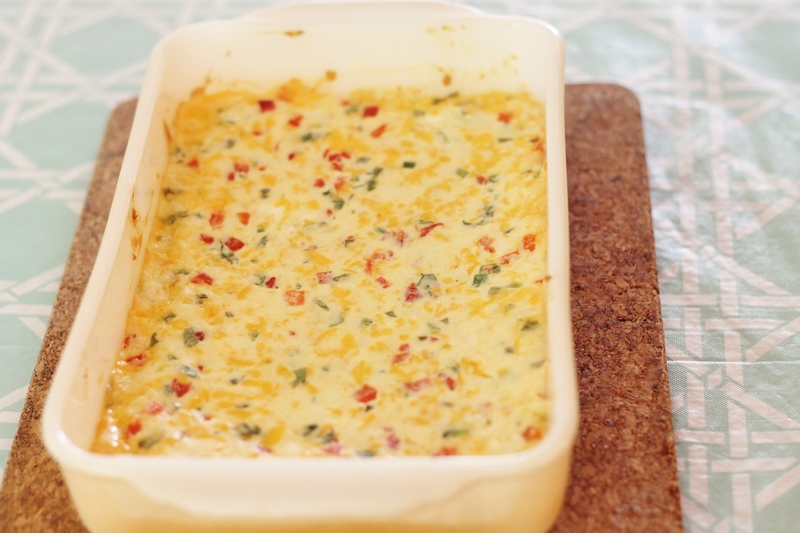 This dip has similar flavors to that jarred queso dip, but this is so much better. It doesn’t have that gluey texture that store bought dips have, just creamy, cheesy goodness. Trust us, you will have zero self control over this dip. We served ours with plain corn chips, but it would probably also be great spread on toasted baguette slices as well. Preheat the oven to 350˚ F. In a large bowl, combine all the ingredients and mix well with a spatula until evenly combined. Spread the mixture in an even layer in a 2-quart casserole dish. Bake 20-25 minutes or until the cheese is completely melted and bubbling. Remove from the oven, garnish with additional cilantro, and serve warm. Note: try to avoid using pre-shredded cheese as when it melts the texture is not as smooth as it should be, due to anti-caking agents.